Make this panna cotta when you're looking for a quick, make-ahead dessert. It takes just a few minutes to whip up and tastes delicious embellished with fresh fruit. Make the panna cotta: Put the water in a small bowl and sprinkle the gelatin over it. Set aside to bloom. In a medium-large bowl, whisk together the cream and yogurt. In a small saucepan, heat the milk and sugar over low heat, stirring a couple of times. Slice the vanilla bean in half lengthwise and, with the tip of a paring knife, scrape the vanilla seeds into the warming milk. Stir. As soon as small bubbles form around the edge of the pan, remove the milk from the heat. Spoon the bloomed gelatin into the warm milk and stir until completely dissolved. Whisk the milk into the cream-and-yogurt mixture until smooth. Pour the mixture into 6 ramekins (small bowls or coffee cups) and refrigerate for several hours or overnight. Make the fruit topping: When ready to serve, peel and slice the fresh peaches into a bowl. Toss with the brown sugar and set aside for several minutes. Assemble the desserts: Slide a knife around the edge of each ramekin to loosen each panna cotta, then invert each onto individual bowls or plates. 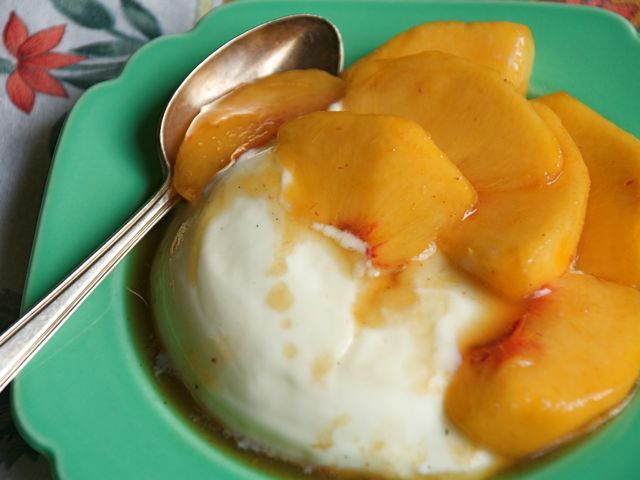 Spoon the peach slices and juices around each serving of panna cotta, then serve.